Those light lunch guidelines are as unknowable as the apocalyptic ending of Knowing and as unfathomable as Captain Nemo's Nautilus. What is the sound of one ham bap? Interpreting one of the rare surviving texts, going all the way back to 2008, suggests a threefold quorum of (1) seating, (2) cake and (3) pot of tea. At which point, might I refer the court to Bat Out Of Hell, track 5. Staggering out of Staples and into the harsh sunlight clutching a 10 pack of BiC Cristal pens -- medium, black, since you ask -- I stumbled across the very definition of serendipity. 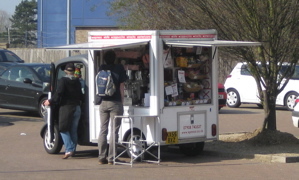 There, waiting for me in the car park sat a mobile coffee van. Not a mirage but instead a "totally self-sufficient state-of-the-art mobile espresso cafe". My ship has come in and, for once, I'm at the dockside. There's a brief wait while the nice lady, Kate, sorts out an order for one of the Staplers, then I'm up: latte, please. Waddya know, she's been working this patch for over five years through all weathers, barring the odd mini tornado or snowdrift. Seems like everyone passing says hello. My latte, served in a classy Lavazza takeaway cup, is very much the business, being both hot enough and having a half-decent kick. Since we're within a star jump of the Klick Fitness gym, it seems only right to indugle in a massive pastry, an artery-bothering bonus Bakewell. No seating per se so it's a low wall near the courthouse, more than fine on such a glorious day. Watching the traffic whoosh past the fire station isn't quite the same as the view from the beach at Orford but it'll do. If only Xpresso had been here when I did a brief stint at Eastern Electricity back in the late 1990s, I'd have been hyper caffeinated and as big as Russell House. Catch Kate mid-morning and lunchtime and say hi. If it was a car -- Coffee Megavan. If they were passing by -- Kate Humble.